A scientist at the photo zenith transit telescope (PZT). The National Research Council's atomic clock would eventually replace instruments used in astronomical observations to calculate time. The PZT telescope's days were numbered. The Dominion Observatory had another mandate — rather than looking up from the Observatory dome, some staff went to the basement to study gravity and seismic activity. The Observatory became part of a growing worldwide network of centres with seismographs to detect earthquakes and to combine the information to determine the location of the seismic activity. The Museum has a couple of early seismographs, but none from the Dominion Observatory. William Frederick King, surveyor and founding Director of the Dominion Observatory. From 1909, when the Geodetic Survey of Canada was established, it operated as a division of the Dominion Observatory in an adjacent building (building no. 12 in photo below). Not only was William Frederick King the Director of the Dominion Observatory and Chief Astronomer, but also Boundary Commissioner and Superintendent of Geodetic Survey. Following King’s death in 1916, the Geodetic Survey Division evolved as an independent branch from astronomy. In its storied 100 year history, the Geodetic Survey of Canada operated under several departments: the Department of the Interior until 1936, the Department of Mines and Resources to 1949, the Department of Mines and Technical Surveys to 1966, the Department of Energy Mines and Resources (EMR) to 1995, and today as part of Natural Resources Canada (NRCan). In this context, the Museum’s Earth physics collections (geodesy, geomatics) include a broad range of survey and measurement instruments such as survey transits, theodolites, gravity meters, seismographs, and geodetic survey makers. Earth Physics at the Dominion Observatory. The various functions are well illustrated by this 1966 aerial photo. No. 12 is the Geodetic Survey Building, completed in 1914, no. 6 is the Gravity and Standards Testing Building, and no. 11, the Geophysical Laboratory. Today, the Dominion Observatory is a Federal Heritage building which rests on the grounds of the Central-Experimental-Farm National Historic Site of Canada. Buildings 3, 8, and 9 have since been removed. The Ingenium Museums have a few examples of gravity sensing apparatus. The oldest, and one of the most significant, is a Mendenhall type gravity apparatus see below. This pendulum apparatus was developed in 1889–90 by T. C. Mendenhall of the United States Coast and Geodetic Survey. The first measurements of gravity in Canada were made with this apparatus in August 1902 by Otto Klotz. He also travelled across the Pacific as a new underwater cable was laid from Canada to Australia, making gravity measurements along the way in places like Tahiti. But continuous, systematic, operations in Canada did not begin until about 1912. According to Dr. Klotz, learning to set up the apparatus in the field required considerable time and skill. Several different pendulums were used in the vacuum within the case to determine the value of “g” by the time they took to make a given number of swings. The precisely made pendulums were mounted one at a time in the chamber, which was evacuated to minimize temperature changes and protect it from wind. The 0.5 metre long pendulums swing back and forth in exactly 1/2 second at 1 g (the value of gravity at the surface of the Earth at a distance equal to the Earth’s average radius). In locations where the gravity is greater or less than 1 g, the pendulum swings slightly faster or slower respectively. For example, if there is a concentration of mass, such as a deposit of iron or nickel, beneath the apparatus, the pendulum swings faster. Marine chronometer by Ulysse Nardin. The period of the swinging gravity pendulums was measured with a marine chronometer adapted to the task. A. H. Miller with the Askania torsion balance and its portable shed that replaced the Medenhall pendulum gravity apparatus in the late 1920s. The Dominion Observatory is well known to older Canadians. It was the source of the daily time signal broadcast on CBC Radio from the 1930s until the time functions were transferred to the National Research Council in 1970. For this and for the continuous signals broadcast on shortwave over CHU, the Observatory created its own talking clock. In the photos below, the first talking clock built at the Observatory (left) was replaced by an Ateliers Brillié Frères machine about 1955 (at centre and right). Artifact no. 1966.0791. The success of the National Research Council scientists by 1958 in building an atomic clock precise enough to replace astronomical observations meant the Dominion Observatory’s days were numbered. The Ateliers Brillié Frères talking clock continued to sound out the time every minute day and night until the Observatory’s closure in 1970. Cesium Atomic Clock (Cs1), 1958, Manufacturer: National Research Council Canada. 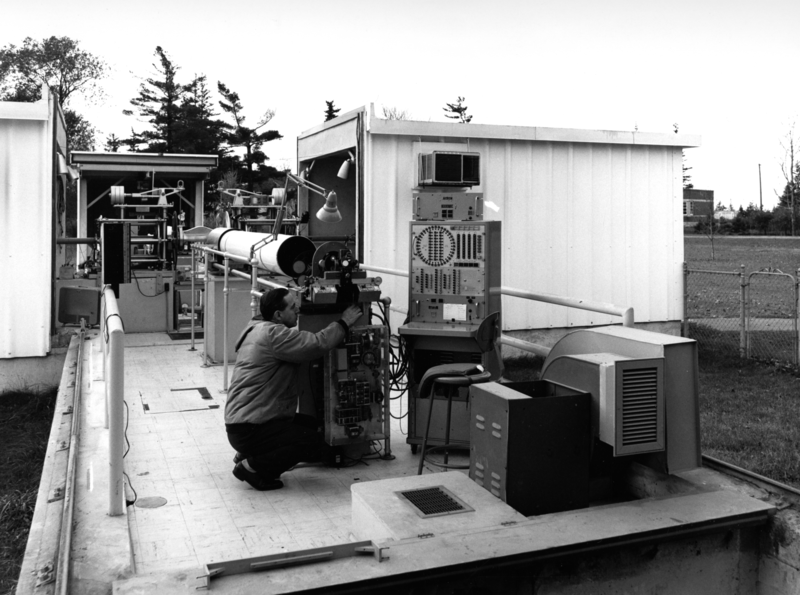 A first in Canada and second in the world when it was built, the NRC's cesium atomic clock provided Canada's master time signal for seven years. It was the first such clock accurate enough to replace the rotation of the Earth as the standard for the precise measurement of time. Source: Applied Physics Division, National Research Council Canada, Artifact no. 1966.0528. With the transfer of time functions and solar observations from the Observatory to the National Research Council in 1970, the 15-inch (38-cm) telescope was only used for public demonstration. However, by 1974 it became obvious that this function would be better served from the Museum and it was in that year that a new observatory was erected in the Museum’s Technology Park to house the great refractor and host public stargazing programs from its new site. Photograph, 1984, A.E. Cross Studios Ltd, Artifact no. 1994.0212. Helen Sawyer Hogg photographed with the Companion of the Order of Canada. In 1988 the observatory was named in honour of Canada’s leading female astronomer, and advocate of public education in astronomy and science, Dr. Helen Sawyer Hogg. Most recently, the Dominion Observatory’s telescope was removed from the Museum’s Helen Sawyer Hogg Observatory. The Ingenium Collection Conservation Centre now occupies the site of the former observatory which was dismantled in 2016 in order to make room for the construction of the new storage facility. Today, the telescope is safely preserved in long term collection storage. It is hoped that one day, this artifact of outstanding significance and national importance will undergo the conservation and restoration treatment it deserves. Astronomy in Canada has been one of our country’s strongest scientific disciplines. In citations to papers in astrophysics, Canadian astronomers are referenced more than astronomers from any other country except the United States and Great Britain. Astronomy research is a changing field. Not only does it now require sophisticated math and computing skills and techniques, but it also includes an increasing number of women. In Canada there is a higher number of women choosing astronomy careers compared to other physical sciences. Research picks up on early work by notable contributors Dr. Helen Sawyer Hogg, Dr. Anne Barbara Underhill and Professor Ruth Northcott. This work fuels today's ground-breaking research by Dr. Victoria Kaspi, recipient of the 2016 Gerhard Herzberg Canada Gold Medal for Science and Engineering, our most prestigious scientific award, Professor Christine Wilson, a Killam Research Fellow, and Dr. Judith Irwin, recipient of numerous teaching awards. The status in astrophysical research in Canada is in large part traceable to the founding of the Dominion Observatory, the Dominion Astrophysical Observatory, and the vision of its early astronomers. Although the optical capabilities of the Dominion Observatory were surpassed by the Dominion Astrophysical Observatory (DAO) in 1917, their astronomers collaborated until the closure of the Dominion Observatory in 1970. The experience of the Queen Elizabeth 2 telescope project in the 1960s as a potential replacement for DAO impacted Canadian astronomical activities for many years. Today, international partnerships lead the way in world-class facilities such as the Canada-France-Hawaii Telescope (CFHT), the Gemini Observatory, the Dominion Radio Astrophysical Observatory (home of the new CHIME radio telescope), as well as the Sudbury Neutrino Observatory to name a few. Long term research priorities continue to place Canadian astronomers among the most productive. Ingenium Museums is privileged to have many significant instruments from the Dominion Observatory, and associated with its founding astronomers and surveyors. Canadian astrophysicist Arthur McDonald received the 2015 Nobel Prize in Physics for his work on neutrinos, a fundamental particle of the universe. McDonald used this underground array of detectors at the Sudbury Neutrino Observatory. John H. Hodgson, The Heavens Above and the Earth Beneath: A History of the Dominion Observatories, Part 1, To 1946, Energy, Mines and Resources Canada, 1989. John H. Hodgson, The Heavens Above and the Earth Beneath: A History of the Dominion Observatories, Part 2, 1946 to 1970, Energy, Mines and Resources Canada, 1994. J.J. Labrecque, The Dominion Observatory Mirror Transit, Journal of the Royal Astronomical Society of Canada, Vol. 57, No. 1, 1963.